In the past five years, the U.S. oil industry has reversed two decades of decline, increasing daily production by 49 percent to 9 million barrels of oil per day. The top five oil producing states — Texas, North Dakota, California, Alaska and Oklahoma — account for about 80 percent of domestic oil production. While recent price reductions will limit new drilling, U.S. oil production is predicted to rise by another million barrels of oil per day in 2015. This recent dramatic expansion in domestic oil production has focused increased attention on the environmental hazards and potential cleanup cost posed by oil spills in drilling, refining and storage operations and the need for a safeguarding or secondary containment method in addition to the primary containment system. 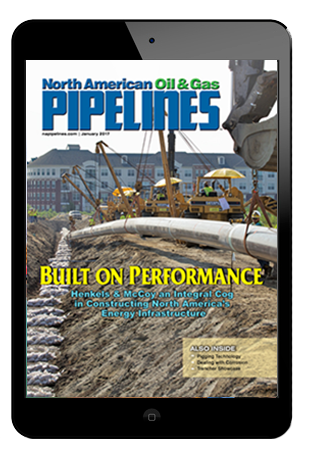 The traditional approach has been to pile native soil into berms creating enclosures surrounding drill sites, pump stations and storage tanks. This approach is effective in slowing the migration of the spilled material but does not prevent soil absorption and contamination, which means that in the event of a spill, the site will require an expensive remediation process. This process can be as extreme as including the removal and disposal of soils. Contamination of adjacent water supplies can be even more complicated and expensive. 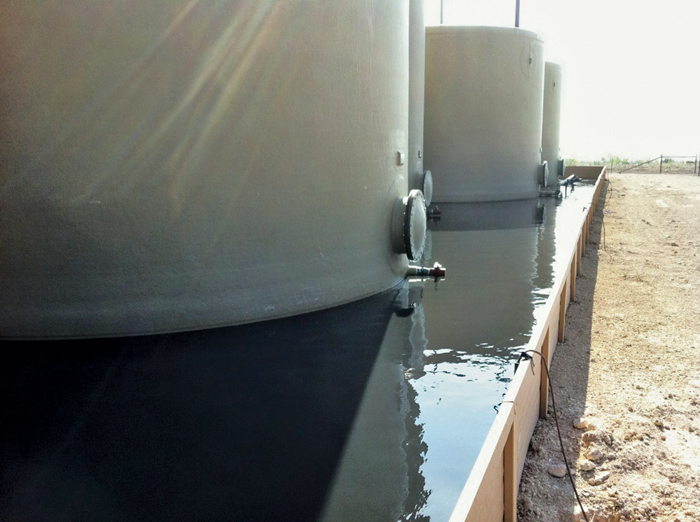 Over the past few decades various styles of containment liners have addressed these concerns by providing a complete containment system that makes it possible to pump the spill cleanly from the containment area while preventing spill migration and soil contamination. The industry has migrated towards the use of geo-membranes that provide a very low permeability barrier to control fluid penetration and soil contamination. the coating system for spray-in-place liners. It is worthwhile to mention that this same methodology is also used to rehabilitate concrete containment and severely pitted steel containment in other types of industrial segments. The overriding objective is to seal off any substrates that are porous. This article will provide an overview of polyurea technology for use in secondary containment liners for oil drilling. TitanLiner’s PermaShield is a state-of-the-art rigid containment solution used by some of the world’s largest oil and natural gas producers. PermaShield features Chemline’s polyurea elastomer coating on geotextile membranes to deliver permanent spill prevention. 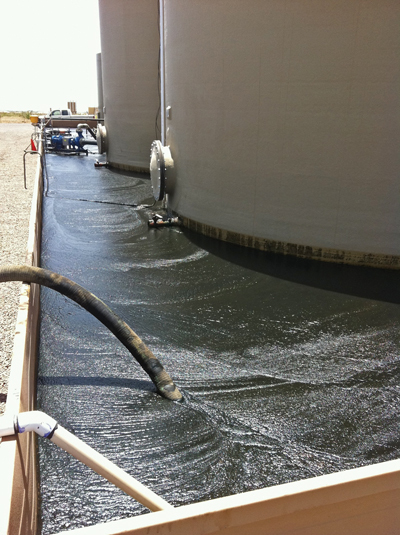 The system is effective at both containing spills and preventing soil contamination. The current trend in secondary containment construction is created by laying geo-fabric in the containment area and spraying a protective coating to provide complete seamless coverage over geo-fabric. The coating most often used is polyurea elastomer. This system offers enhanced flexibility, rapid application and cure speed for quick seaming when compared to other systems. Assembly is fast and easy because of this method’s ability to conform to various shapes and to existing structures such as pipes and tanks. Polyurea provides chemical resistance to contain oil, drilling fluids and reagents used in fracturing. High tensile strength, tear strength and elongation of polyurea coated geo-fabric provides the strength needed to resist the impact of equipment and tools without leaking and provides excellent cut tear resistance. Stress cracking is not normally a factor with polyurea products. The site should be prepared prior to installation. To provide reliable secondary containment, it’s important to ensure stability of the underlying soil and to prevent soil from sliding under the liner. A layer of clay, sand or gravel is often placed at a uniform depth upon the compacted soil prior to placement of the polyurea geo-textile membrane. The ground must be dry and free of stones, sticks, metal and other objects that might puncture the liner. The longevity of the membrane is highly correlated to its thickness. Polyurea geo-textile membrane is typically applied at a thickness of 60 to 80 mils (1.5 to 2 mm). In the typical application, this will provide sufficient resistance to mechanical shock, chemicals and weather. In many applications, thicknesses as great as 100 mils (2.5 mm) are specified in order to increase service life and reliability. The crew installing the liner should wear rubber-soled footwear to avoid damaging the geo-textile during the installation process. The arrangement of the geo-textile membrane sheets should start at the center of the containment area and move out toward the perimeter in order to account for shrinkage of the membrane system. Depending on conditions of the installation, the geo-textile panels may need to be anchored in place prior to coating. The adjacent panels should overlap each other by at least 6 in. The polyurea coating should then be sprayed with uniform passes over the surface of the geo-textile sheets. Lap joints should be coated on both sides and then sealed together before the coating has dried. Care should be taken to ensure that the membrane is coated completely and any air pockets should be removed with a hand tool. The coating remains in gel form for mere seconds and is tack-free 8 to 12 seconds after application. Cure time is typically about 12 hours. Acceptable application temperature ranges from 20 to 125 F (-7 to 50 C). The coating is applied with heated high pressure spray equipment at pressures of 2,000 to 3,000 psi and a spray temperature of 150 to 180 F (65 to 82 C). 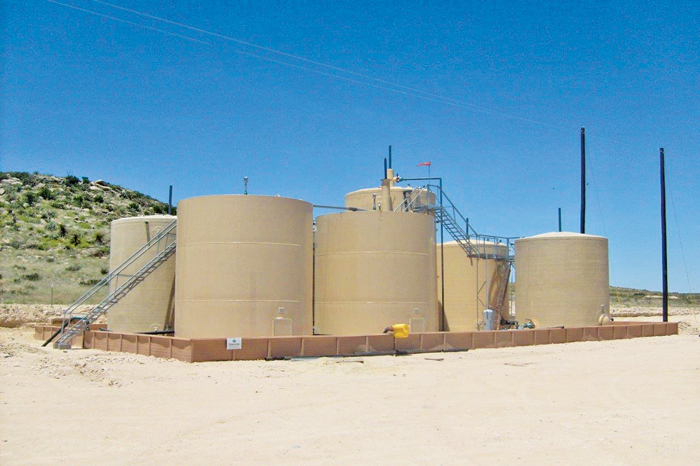 The use of geo-membrane for secondary containment at oil production sites will likely grow in the coming years, according to Tim LaBorde, president of Labcorr Polymer Solutions, based in Houston. 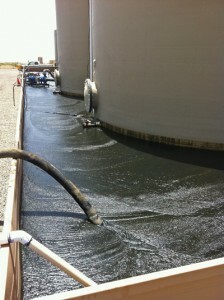 LaBorde adds that polyurea coated geo-textile membranes are currently the state of the art for secondary containment, but more needs to be done to open up communications between the specifiers, including owners and engineering companies, as well as the manufacturers of membranes, coatings and equipment. Alan J. Cain is a senior research chemist and group leader at Chemline Inc. and has been formulating polyurethanes and polyureas for industrial applications for more than 25 years. He is a NACE-certified Level 3 Coatings Inspector. Check out http://t.co/r6zc86kcBr. My comments are included in this article about use of polyuria-geotextile membranes for containment.